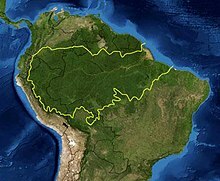 A map of the Amazon rainforest ecoregions. The yellow line encloses the ecoregions per the World Wide Fund for Nature. An ecoregion (ecological region) is an ecologically and geographically defined area that is smaller than a bioregion, which in turn is smaller than an ecozone. All three of these are either less or greater than an ecosystem. 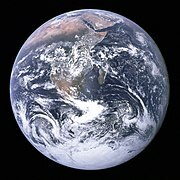 [clarification needed] Ecoregions cover relatively large areas of land or water, and contain characteristic, geographically distinct assemblages of natural communities and species. The biodiversity of flora, fauna and ecosystems that characterise an ecoregion tends to be distinct from that of other ecoregions. In theory, biodiversity or conservation ecoregions are relatively large areas of land or water where the probability of encountering different species and communities at any given point remains relatively constant, within an acceptable range of variation (largely undefined at this point). The history of the term is somewhat vague, and it had been used in many contexts: forest classifications (Loucks, 1962), biome classifications (Bailey, 1976, 2014), biogeographic classifications (WWF/Global 200 scheme of Olson & Dinerstein, 1998), etc. The concept of ecoregion of Bailey gives more importance to ecological criteria, while the WWF concept gives more importance to biogeography, that is, distribution of distinct biotas. An ecoregion is a "recurring pattern of ecosystems associated with characteristic combinations of soil and landform that characterise that region". Omernik (2004) elaborates on this by defining ecoregions as: "areas within which there is spatial coincidence in characteristics of geographical phenomena associated with differences in the quality, health, and integrity of ecosystems". "Characteristics of geographical phenomena" may include geology, physiography, vegetation, climate, hydrology, terrestrial and aquatic fauna, and soils, and may or may not include the impacts of human activity (e.g. land use patterns, vegetation changes). There is significant, but not absolute, spatial correlation among these characteristics, making the delineation of ecoregions an imperfect science. Another complication is that environmental conditions across an ecoregion boundary may change very gradually, e.g. the prairie-forest transition in the midwestern United States, making it difficult to identify an exact dividing boundary. Such transition zones are called ecotones. Ecoregions can be categorized using an algorithmic approach or a holistic, "weight-of-evidence" approach where the importance of various factors may vary. An example of the algorithmic approach is Robert Bailey's work for the U.S. Forest Service, which uses a hierarchical classification that first divides land areas into very large regions based on climatic factors, and subdivides these regions, based first on dominant potential vegetation, and then by geomorphology and soil characteristics. The weight-of-evidence approach is exemplified by James Omernik's work for the United States Environmental Protection Agency, subsequently adopted (with modification) for North America by the Commission for Environmental Cooperation. The use of the term ecoregion is an outgrowth of a surge of interest in ecosystems and their functioning. In particular, there is awareness of issues relating to spatial scale in the study and management of landscapes. It is widely recognized that interlinked ecosystems combine to form a whole that is "greater than the sum of its parts". There are many attempts to respond to ecosystems in an integrated way to achieve "multi-functional" landscapes, and various interest groups from agricultural researchers to conservationists are using the "ecoregion" as a unit of analysis. Ecologically based movements like bioregionalism maintain that ecoregions, rather than arbitrarily defined political boundaries, provide a better foundation for the formation and governance of human communities, and have proposed ecoregions and watersheds as the basis for bioregional democracy initiatives. Marine ecoregions are: "Areas of relatively homogeneous species composition, clearly distinct from adjacent systems….In ecological terms, these are strongly cohesive units, sufficiently large to encompass ecological or life history processes for most sedentary species." They have been defined by The Nature Conservancy (TNC) and World Wildlife Fund (WWF) to aid in conservation activities for marine ecosystems. Forty-three priority marine ecoregions were delineated as part of WWF's Global 200 efforts. The scheme used to designate and classify marine ecoregions is analogous to that used for terrestrial ecoregions. Major habitat types are identified: polar, temperate shelves and seas, temperate upwelling, tropical upwelling, tropical coral, pelagic (trades and westerlies), abyssal, and hadal (ocean trench). These correspond to the terrestrial biomes. See Global 200 Marine ecoregions for a full list of marine ecoregions. In 2007, TNC and WWF refined and expanded this scheme to provide a system of comprehensive near shore (to 200 meters depth) Marine Ecoregions of the World (MEOW). The 232 individual marine ecoregions are grouped into 62 marine provinces, which in turn group into 12 marine realms, which represent the broad latitudinal divisions of polar, temperate, and tropical seas, with subdivisions based on ocean basins (except for the southern hemisphere temperate oceans, which are based on continents). Major biogeographic realms, analogous to the eight terrestrial ecozones, represent large regions of the ocean basins: Arctic, Temperate Northern Atlantic, Temperate Northern Pacific, Tropical Atlantic, Western Indo-Pacific, Central Indo-Pacific, Eastern Indo-Pacific, Tropical Eastern Pacific, Temperate South America, Temperate Southern Africa, Temperate Australasia, Southern Ocean. A map of Freshwater Ecoregions of the World, released in 2008, has 426 ecoregions covering virtually the entire non-marine surface of the earth. ^ Loucks, O. L. (1962). A forest classification for the Maritime Provinces. Proceedings of the Nova Scotian Institute of Science, 25(Part 2), 85-167. ^ Bailey, R. G. 1976. Ecoregions of the United States (map). Ogden, Utah: USDA Forest Service, Intermountain Region. 1:7,500,000. ^ Bailey, R. G. 2002. Ecoregion-based design for sustainability. New York: Springer, . ^ a b Bailey, R. G. 2014. Ecoregions: The Ecosystem Geography of the. Oceans and Continents. 2nd ed., Springer, 180 pp., . ^ Olson, D. M. & E. Dinerstein (1998). The Global 200: A representation approach to conserving the Earth's most biologically valuable ecoregions. Conservation Biol. 12:502–515. ^ Omernik, J. M. (2004). Perspectives on the Nature and Definition of Ecological Regions. Environmental Management. p. 34 – Supplement 1, pp.27–38. ^ a b "Marine Ecoregions of the World". World Wide Fund for Nature. ^ Hermoso, Virgilio; Abell, Robin; Linke, Simon; Boon, Philip (2016). "The role of protected areas for freshwater biodiversity conservation: challenges and opportunities in a rapidly changing world". Aquatic Conservation: Marine and Freshwater Ecosystems. 26 (s1): 3–10. doi:10.1002/aqc.2681. ^ "Freshwater Ecoregions of the World". WWF. Abell, R., M. Thieme, C. Revenga, M. Bryer, M. Kottelat, N. Bogutskaya, B. Coad, N. Mandrak, S. Contreras-Balderas, W. Bussing, M. L. J. Stiassny, P. Skelton, G. R. Allen, P. Unmack, A. Naseka, R. Ng, N. Sindorf, J. Robertson, E. Armijo, J. Higgins, T. J. Heibel, E. Wikramanayake, D. Olson, H. L. Lopez, R. E. d. Reis, J. G. Lundberg, M. H. Sabaj Perez, and P. Petry. (2008). Freshwater ecoregions of the world: A new map of biogeographic units for freshwater biodiversity conservation. BioScience 58:403-414, . Olson, D. M., Dinerstein, E., Wikramanayake, E. D., Burgess, N. D., Powell, G. V. N., Underwood, E. C., D'Amico, J. A., Itoua, I., Strand, H. E., Morrison, J. C., Loucks, C. J., Allnutt, T. F., Ricketts, T. H., Kura, Y., Lamoreux, J. F., Wettengel, W. W., Hedao, P., Kassem, K. R. (2001). Terrestrial ecoregions of the world: a new map of life on Earth. Bioscience 51(11):933-938, . Spalding, M. D. et al. (2007). Marine ecoregions of the world: a bioregionalization of coastal and shelf areas. BioScience 57: 573-583, . Burgess, N., J.D. Hales, E. Underwood, and E. Dinerstein (2004). Terrestrial Ecoregions of Africa and Madagascar: A Conservation Assessment. Island Press, Washington, D.C., . Thieme, M.L., R. Abell, M.L.J. Stiassny, P. Skelton, B. Lehner, G.G. Teugels, E. Dinerstein, A.K. Toham, N. Burgess & D. Olson. 2005. 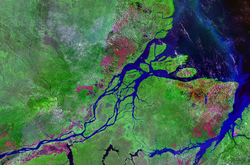 Freshwater ecoregions of Africa and Madagascar: A conservation assessment. Washington DC: WWF, . Olson, D. M., E. Dinerstein, G. Cintron, and P. Iolster. 1996. A conservation assessment of mangrove ecosystems of Latin America and the Caribbean. Final report for The Ford Foundation. World Wildlife Fund, Washington, D.C.
Ricketts, T.H. et al. 1999. Terrestrial Ecoregions of North America: A Conservation Assessment. Washington (DC): Island Press, . Krever, V., Dinerstein, E., Olson, D. and Williams, L. 1994. Conserving Russia's Biological Diversity: an analytical framework and initial investment portfolio. WWF, Switzerland. Wikimedia Commons has media related to Ecoregions.